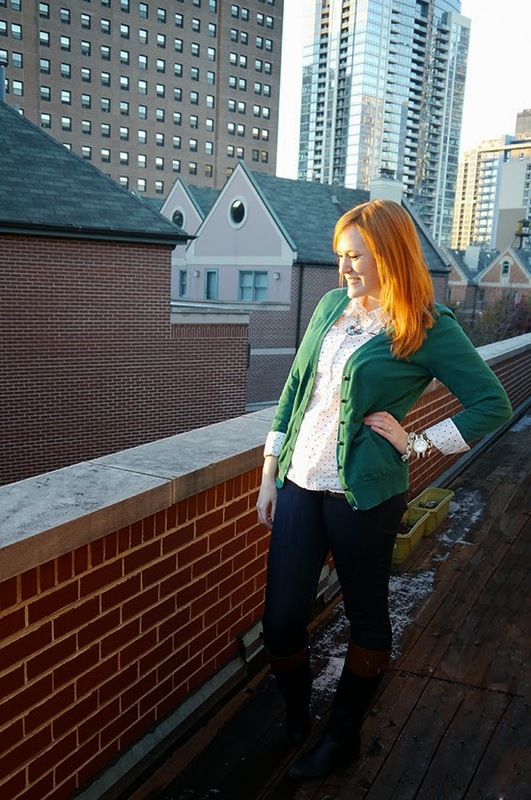 Every year around December this green cardigan becomes my new best friend. Paired with polka dots and some pretty jewels and I'm golden. Looking at this post is making me realize how much my style has evolved over the past couple of years. I never used to wear button downs, and if I added a cardigan to an outfit it was strictly for warmth purposes. I threw on an outfit the other day when all of my clothes were dirty and was instantly taken back to 2008 Kristina, who wore a lot of v-neck tee shirts with camis and rarely sported any jewelry. If only that girl could see me now, she'd be so proud! P.S. Don't forget to enter the Rebecca Minkoff giveaway!! Emerald looks so great on you, Kristina! And I'm sure I've said this before, but I'm constantly jealous of your roof. I wish my apartment had something similar! you look amazing! is that the roof of your place? great view! Green is such a great color on you! And I'm loving that polka dot button down! This outfit reminds me that I have a cardigan similar to this and never wear. Emerald looks stunning on you! This looks amazing! I often wish I had a green cardigan, this reminds me why! 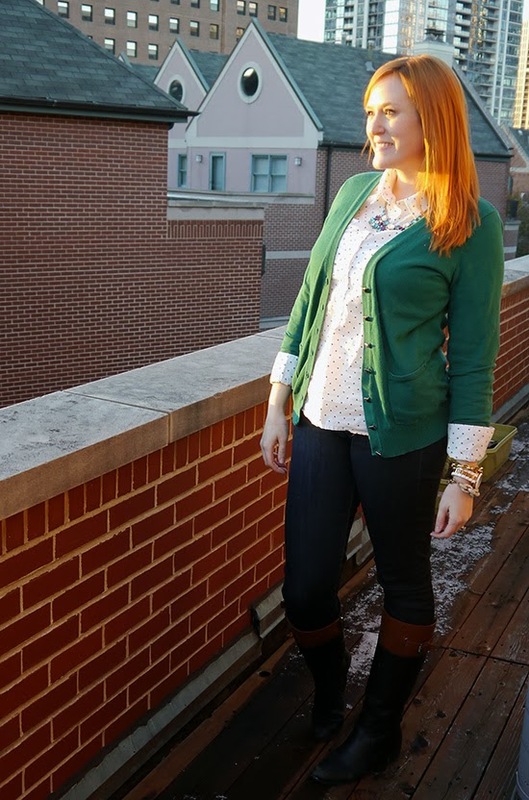 Too funny I wore an almost identical emerald cardigan today! Great minds think alike! I'm really liking the color of this cardigan on you. And that necklace is so pretty! This is the perfect color and cardigan before the holidays. 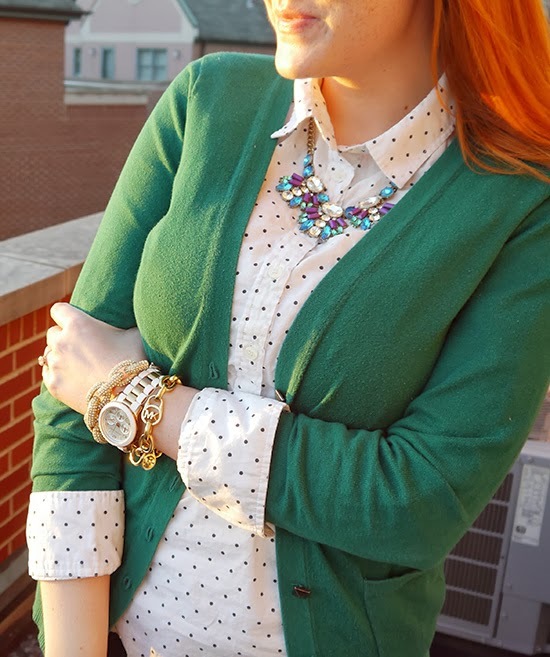 I love how you paired it with the polka dot shirt and statement necklace. Gorgeous golden girl indeed! You make the layering look so effortless. I love emerald around the holidays! You look great!